No matter what you do, the food of your people will call for you. I had a craving for nem nuong one day and there wasn’t a Vietnamese deli or restaurant closeby that would satiate the craving. The boo and I decided to try our hand at making nem nuong. I knew my mom wouldn’t relinquish her recipe to me, so I did the next best thing and googled it. I stumbled on the amazing food blog Food for Four that had a TON of Vietnamese recipes (some that I was familiar with, and some not so much). We went to our local 99 Ranch market to round up the ingredients and tried it out! It isn’t exactly like mom’s, and it doesn’t have that pink tinge you may be used to seeing, but when done right, it’s juicy and delicious! The meat is super versatile, so once the meat is done, cook it how you would cook a meatloaf, meat on a stick, grilled, or whatever. We made them into patties and grilled them. Yum. In a small bowl, add fish sauce, sugar and white pepper. Stir the mixture until sugar almost dissolved. Set aside. In a large bowl, add the ground pork (ask your butcher to mince it twice if you can), add fish sauce mixture. Add garlic. Using your hands, knead the meat mixture until all the ingredients are combined. In a separate small bowl, add the water and baking powder. Stir the mixture, it will foam up. Pour baking powder mixture into the pork mixture. Knead the meat mixture until all the ingredients are combined. Rub a very small amount of oil into the palm of your hands so that the meat does not stick to it. 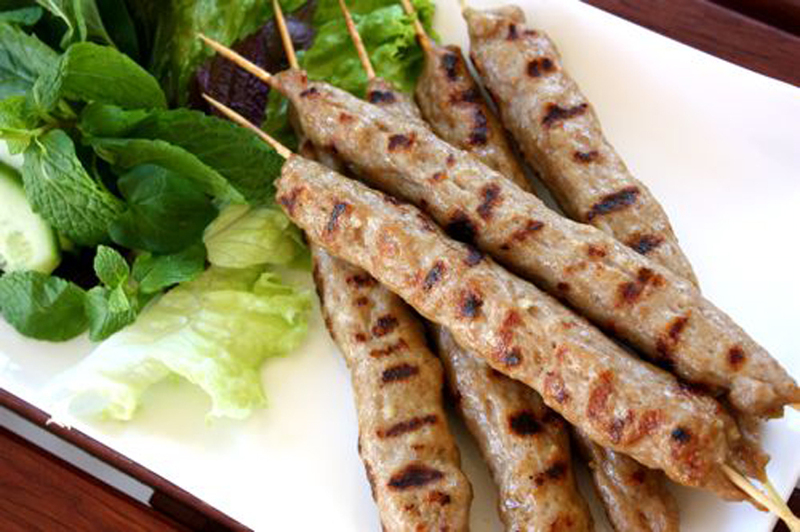 Form the sausage shape and put through the skewers. You can roll into balls if you like. Heat up a grill or barbeque and cook. Turning the skewers over when they are golden brown. SO. GOOD. It hasn’t failed us yet. looks delicious! it’s so hard to get recipe out of moms, isn’t it? It totally is! C’mon Mom, just GIVE ME THE RECIPE.